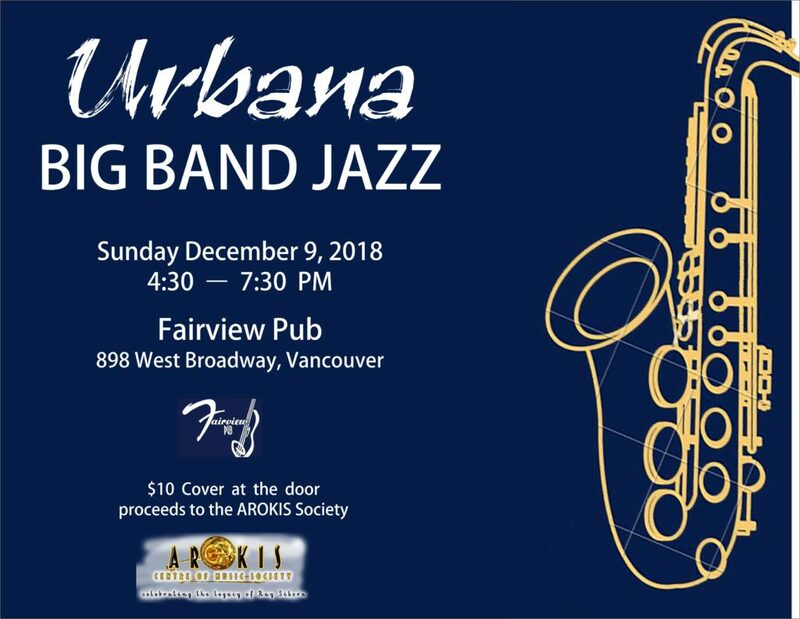 Urbana is performing at the Fairview Pub on Sunday, December 9 from 4:30 to 7:30pm. The 17 piece big band will be playing three sets of classic and modern swing music including charts by Count Basie, Quincy Jones, Oliver Nelson, Sammy Nestico, Cedar Walton and Henry Mancini plus more contemporary funk and rock selections. The members of Urbana – professional and amateur alike – share a strong appreciation of the big band format and relish the opportunity to expose new audiences to this wonderful music. Urbana is directed by jazz musician, composer and music educator Robin Shier. Door charge is only $10 with proceeds going to Arokis Centre of Music Society to aid in the promotion of this wonderful music.